21-year-old Yaolin Wang was fatally stabbed by her boyfriend, who killed himself. Tragic news out of Indiana... Last week in Bloomington, an Indiana University student was found dead in her apartment, apparently stabbed by her boyfriend who then killed himself in a murder-suicide. 21-year-old Yaolin Wang, a junior at Indiana University, was found dead from apparent stab wounds last Wednesday. Police suspect her boyfriend, 20-year-old Chuanlin Xiao, killed her before hanging himself. They had been in a relationship for about six months and lived together in the apartment building. Just days after Wang's murder, another IU student was found dead in a separate incident. 20-year-old Joseph Smedley II was found dead in an apparent drowning. 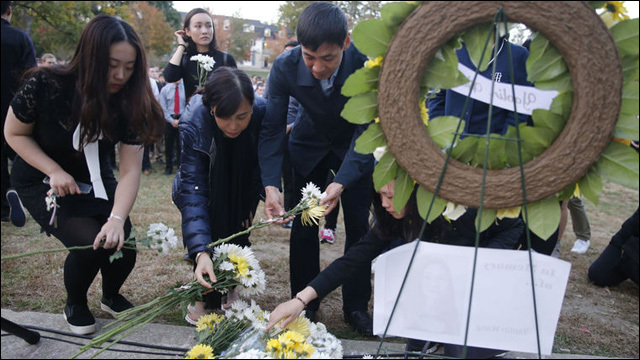 Hundreds gathered on Indiana University's campus Wednesday night for a vigil to pay tribute to Wang Smedley. "I wasn't prepared to speak," said Wang's father, speaking through a translator. "I am filled with complete and devastating sadness, but I still must speak." Wang's father said he had come to visit his daughter from China on her 21st birthday, Sept. 18. He said Wang was so proud to show him around the campus "and excited to get into Indiana University." "Not even half a month has passed since I was here with her that Yaolin is no longer here," he said. In honor of her memory, and her fondness for the university, Wang's father said he would take the tuition that was returned to him and start an endowment fund in Yaolin's name at IU so that "she never has to leave."